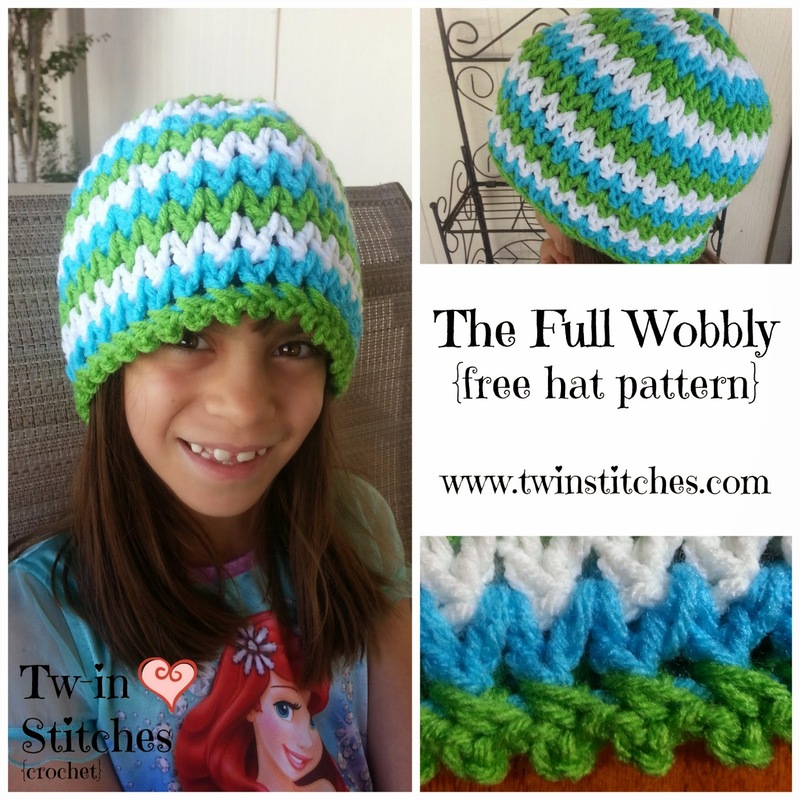 I am totally excited to share with you the first of two wobbly v-stitch hats: The Full Wobbly! The Full Wobbly is comprised of v-stitches from the very beginning. The fun part about the wobbly patterns, remember, is that the v-stitches are made using the dc2tog stitch (the double crochet 2 together). This method has been addicting to me and I love using it as often as I can! Dc2tog: Begin a dc in on space and pull up yarn through two loops only (3 loops on hook). Yarn over and insert hook through next chain 1 space. Yarn over, pull up through two loops (3 loops on hook). Yarn over and pull through all three loops. Regular Wobbly V-Stitch is made by a series of 2 dc2togs: Begin a dc2tog in a chain 1 space and complete the dc2tog in the next chain 1 space. Chain 1. Begin the next dc2tog in the SAME chain 1 space and complete it in the next. 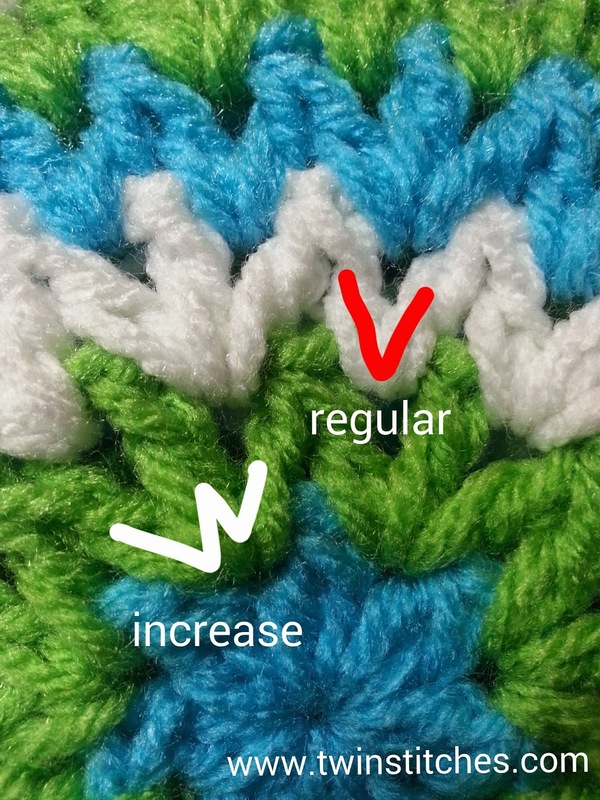 Increase Wobbly V-Stitch: To increase, we will crochet a chain 1, dc, chain 1 between Wobbly V-Stitches. So: Begin a dc2tog in a chain 1 space and complete it in the next chain 1 space. In the same space, chain 1, DC, chain 1, begin your next dc2tog and complete it in the next chain 1 space. The Increase Wobbly V-Stitch looks like a W.
Row 1 (Color 1): Start with a Magic Circle. Chain 4 (counts as 1 DC and 1 chain). *Dc2tog, chain 1* six times in the magic circle. DC and join to the third chain of the beginning chain 4. You will have seven chain 1 spaces. Fasten off. Row 2 (Color 2): In this round we are going to crochet an Increase Wobbly V-stitch in each chain 1 space. Remember that because we are doing the wobbly v-stitches, half of the v will begin in a chain 1 space and end in the next. Row 3 (Color 3): In this round, we will alternate increase Wobbly V-Stitch in one chain 1 space and regular wobbly v-stitch in the next. 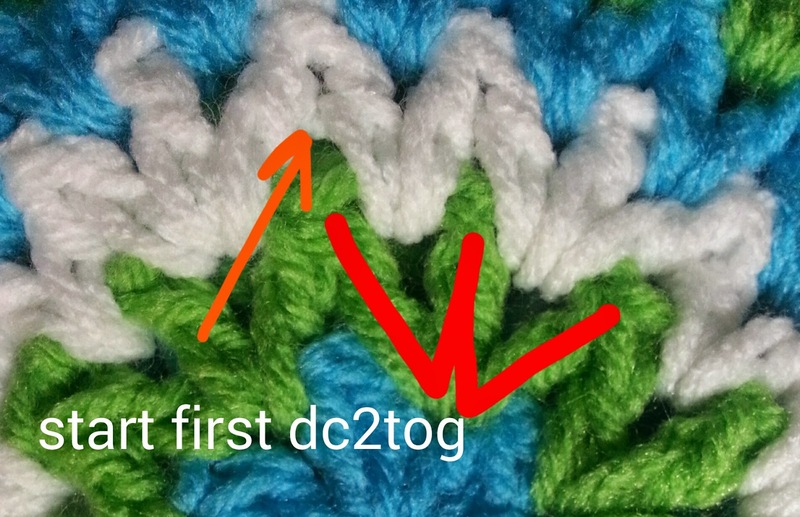 With a new color, begin a standing dc2tog in the left chain 1 space of any of the Increase Wobbly V-Stitches. It is important to the way we will be increasing that you start here. Since the increase looks like a W, you will start in the left opening of the W. Complete your dc2tog in the next space. *In the same space, chain 1, dc, chain 1, start the next dc2tog. Complete the dc2tog in the next space. Chain 1, begin the next dc2tog in the same space, complete in the next chain 1 space. * Repeat from * to * around. (You should have alternating increases and regular wobbly Vs in each chain 1 space around.) Chain 1 and join to the top of the first dc2tog. Fasten off. The standing dc2tog goes in the left chain 1 space of an increase wobbly. Row 4 (Color 1): In this round we will follow this pattern: Increase wobbly, regular wobbly, regular wobbly. With a new color, begin a standing dc2tog in the left chain 1 space of any Increase Wobbly from row 3 and complete in the next space. *In the same space, chain 1, dc, chain 1, start the next dc2tog. Complete the dc2tog in the next space. Chain 1, begin the next dc2tog in the same space, complete in the next chain 1 space. Chain 1, begin the next dc2tog in the same space, complete in the next chain 1 space. * Repeat from * to * around. Chain 1, and join to the top of the first dc2tog. Do you see it? One more regular wobble V for each row. This is just like any circle you crochet. You increase the number of regular stitches as the circle gets bigger and bigger. My hat, for an adult, needs one more row of increases. Row 5 (Color 2): Again, remember to begin a standing dc2tog in the left chain 1 space of any Increase Wobbly from row 4. Then, continuing the pattern of increase, regular, regular, regular around. Chain 1 and join to the top of the first dc2tog. When you have reached the diameter you want, you will stop increasing. For the purpose of this pattern, I am going to call this Row 6, but it is really which ever row you are on. Row 6 (no increases): With a new color, begin a standing dc2tog in any chain 1 space. and complete it in the next chain 1 space. *Chain 1, begin the next dc2tog in the same space and complete in the next chain 1 space. * Repeat from * to * around. Your final dc2tog should end in the same space as the first dc2tog. Chain 1 and join to the top of the first dc2tog. Fasten off. Row 7 - 13: With alternating colors, repeat row 6. Make sure to measure your hat to make certain it is long enough. An adult sized hat should be about 9 inches from crown to ear. Add more rows if necessary. Finish: You can use any border you like. For this one, I am using what I call a faux picot crossover stitch. I love this stitch and I use it for almost all of my blankets! It looks much more challenging that it actually is! With a new color, make a standing single crochet in any chain 1 space. Chain 2. Working from front to back, insert your hook into the unworked chain 1 space to the right of the space you began. Yarn over and pull through the stitch to the front. Yarn over and pull through both loops. *Move to the next unworked chain 1 space to the left. SC in that space. Chain 2. Insert your hook back into the previous space. Yarn over and pull through the stitch to the front. Yarn over and pull through both loops. * Repeat from * to * around. You will end by beginning your last faux picot crossover in the first chain 1 space (it will have on stitch in it). 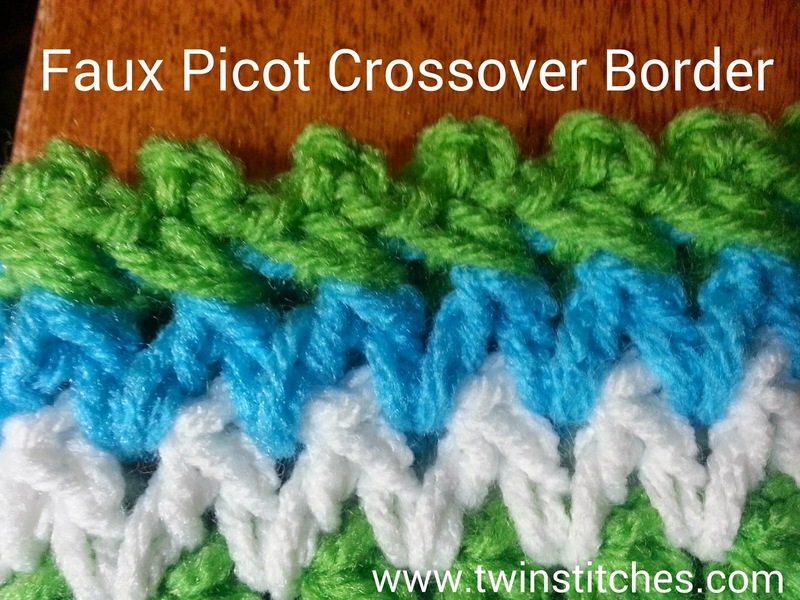 Complete the crossover and slip stitch into the first sc. Fasten off. Weave in all ends carefully. Row 1 (Color 1): Start with a Magic Circle. Chain 4 (counts as 1 DC and 1 chain). *Dc2tog, chain 1* five times in the magic circle. DC and join to the third chain of the beginning chain 4. You will have SIX chain 1 spaces. Fasten off. Continue with the pattern as it reads. You will have multiples of 6 in each row instead of multiples of 7 as my pattern calls for. I'm seriously in love with this pattern and I hope you are as well! Enjoy! Want to make a blanket that goes with this hat?